We collected nasal swabs from pigs and farm workers at 45 swine herds (21 antibiotic-free herds; 24 conventional herds) in Illinois, Iowa, Minnesota, North Carolina and Ohio. 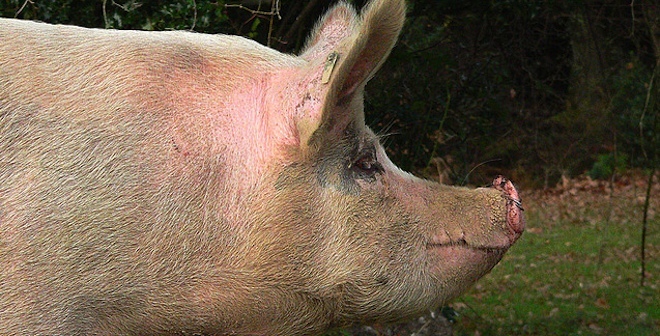 MRSA was isolated from 50 of 1085 pigs (4.6%) and 31 of 148 (20.9%) of farm workers. MRSA-positive pigs and people were clustered in four conventional swine farms in Iowa and Illinois. 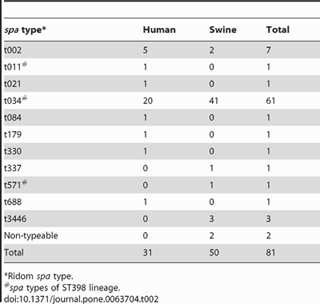 Based on genotyping, spa type t034, a common livestock associated variant, was predominant among both human and swine isolates. These results confirm the presence of LA-MRSA in pigs and swine farm workers in the USA, but the prevalence found is relatively low compared with European studies. As I mentioned in my last post, that staph or MRSA would be found in farm workers is not unusual: roughly one-third of the population carries staph in their nostrils at any time, without experiencing an infection, and about 4 percent of the population carries MRSA, drug-resistant staph. The question has been, how common is MRSA ST398, a strain of drug-resistant staph that can be linked back to farm drug use by its specific resistance signature? The answer is important, not just because it reveals a specific potential human health risk, but also because it helps to fill in the still-disputed question of how much farm-drug use contributes to the increase in antibiotic resistance overall. The table to the right, from Smith’s paper, answers the question for the group of farm workers they took samples from: Out of 31 people in the group who carried some strain of MRSA, 21 were carrying the livestock strain. Those workers were in Iowa and Illinois, and one was in Ohio; and the previous work Smith and colleagues did found livestock MRSA in Iowa as well. That makes North Carolina, discussed in my last post, the fourth state in which livestock MRSA has been found in farm workers. Livestock MRSA has now been found in pigs in those states, and Minnesota, South Dakota and Connecticut. As I mentioned, livestock MRSA has a specific genetic signature — resistance to tetracycline — that has been interpreted to be the result of tetracycline use in swine-raising. (Tetracycline resistance is unusual in human MRSA because tetracycline isn’t commonly prescribed for the infection. When it appears, it may be because the gene for tetracycline resistance has traveled into the bacterium as part of a set of genes conferring resistance to several antibiotics at once.) There is an interesting discussion in Smith’s paper of whether on-farm antibiotic use is in fact responsible, or whether other factors are influencing the staph strains; but it is complex enough to leave for another post.